So you can feel left and right CP and everything feels fine? Some locks can be quite tricky because the gates are quite low and are covered by other wheels. My strategy is mostly not to find the gate, but just to optimize the lever position. Every little bit the lever sits lower is an advantage. For this I search for a low for all wheels by either doing e.g. an AWR or try a few different combinations. Then I optimize each wheel separately one after the other, e.g. W3, W2, W1, W3, W3, W1, ... . In this process it is the best not to switch rotation direction because some locks have huge differences there. I also have CPJournal software its really nic not to write down everything and it saves all my safe information. 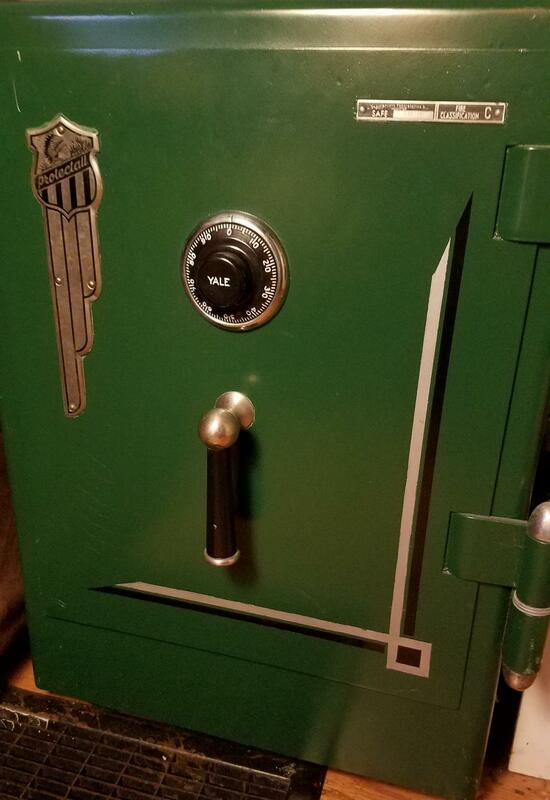 I believe your safe is from around 1948-1950 and is from the time where Protectall safes stopped having Yale 0700 locks and got Mosler locks installed when Mosler acquired Protectall. I just looked at an old Mosler lock and I have the same dial and dial ring, and the font of the numbers is spot on. At first I thought you had the S-201 lock mounted VD, but your Indian logo background is black not red, so a book I have says you have the Mosler 302 lock mounted RH (as looking from inside the safe at the lock), which means that drill point is not gonna hit anything. You could drill the left side of the door and punch the bolt in, but I dont know how thick your door is on that model, and you mentioned you don't really want to drill either. retracting your safe lock's bolt directly pulls on the door bolt(s) I'm gonna assume you have 1 active locking bolt in that door directly left of the dial. I painted my safe green and painted some pin stripes as well. Lucky for you, the Mosler 302 lock can be manipulated (yours is not the Group 1 MR 302 manipulation resistant "click click" version), so read the threads here and get your graph paper out. or try 50-25-50, the factory combination. I found a photo of your model open, and you can see it has 1 static bolt on the hinge side, and then there is 1 active bolt which is directly connected to the lock's bolt. 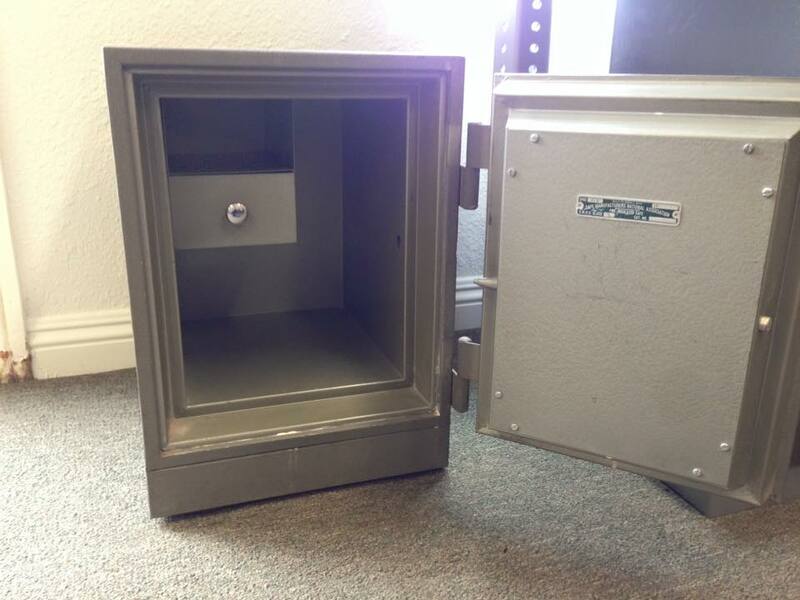 You can extrapolate how deep the bolt is, drill a 1/4 inch hole on the left side of the safe, and as someone pulls on the grab handle, insert a punch into the hole you drilled, give it a good spack or two with a baby sledge hammer and the bolt should retract enough to pull the door open. 1. do you know the dialing order of your lock? as in dial 4 times left to 1st number, dial 3 times right to 2nd number, 2 times left to 3rd number, 1 times, slowly rIght until it drops in and retratcts the bolt around 0 and comes to complete stop? 2. am I understanding that graphing AWL, you believe the strongest indication of a true gate is at 62.5 ? Have you dialed 55 to 65 in one number increments to magnify your reading and get a better gate shaped graph? I dont know what "I did wr I got 32.5" means, can you expand on what "wr" is (wheels right?) or do you mean you also did AWR and found what you believe is a true gate at 32.5? have you amplified that gate by dialing 25 to 35 and going back to the contact area to measure for differences? 3. Have you done high low tests to make sure 62.5 and 32.5 are on the wheels you think they are on? to do what you are asking you will have to do an exhaustive search of dialing a test number, then dialing 32.5 and then 62.5 and then turning to the drop in. didnt work? pick up all wheels left, dial next 1st combination number in line, then dial wheel 2 to 62.5, then dial wheel 3 to 32.5 and then dial to drop on. At least I believe this is what you are asking. Oldfast probably has some good dialing shortcuts so you don't have to redial everything over by picking up AWL each time you try the next possible Wheel 1 number. contact points r94 and l5 this is what i did r@52 l@62.5 l@625 94 and 4 next l@62.5 r@52 l@62.5 94 2.5 last l@62.5 l@ 62.5 r@ 52 97 3.5 does this sound right ok how do i find the contact point. thats what im missing. im doing the high test and then both low and high for 32.5. i really appriate all the help i can get. ive been picking locks for apts. for years and just started the safes im 60 and retired but i would love to go back to school for safe and vault tect. r@72.5 l@62.5 l@62.5 l95.5 r2.5 contact point ? l@62.5 r@72.5 l@62.5 l96.5 r4 contact point ? l@62.5 l@62.5 r@72.5 l96 r4 ?? I think you lack some understanding. You really should read a bit more about manipulation. AL usher69 wrote: contact points r94 and l5 this is what i did r@52 l@62.5 l@625 94 and 4 next l@62.5 r@52 l@62.5 94 2.5 last l@62.5 l@ 62.5 r@ 52 97 3.5 does this sound right ok how do i find the contact point. thats what im missing. im doing the high test and then both low and high for 32.5. i really appriate all the help i can get. ive been picking locks for apts. for years and just started the safes im 60 and retired but i would love to go back to school for safe and vault tect. I dont want to offend you, but it doesn't sound quite like you got the right instructions on how to manipulate. I wish I was good at explaining it, and maybe there is a PDF file or post or youtube video explaining it better, but the whole idea isn't just to keep finding contact points, we already know where they are, what we are testing for is if when we move and park all the wheels to a certain number, we then turn the dial back to the contact points and measure them at that moment in time to see what they are. for most of the dial from 99 down to 1, your contact point measurements will probably be the same, lets say they'll always read RCP 94, and LCP 5, but then suddenly, you'll be move the dial to test a new number along the dial, let's say you park all the wheels on 50, then you turn the dial back to the contact points, and feel for when the nose hits the contact points and you may notice a very slight change of RCP being 94.4 and the LCP being 4.6 a change that big would indicate something interesting, possibly a gate on one of the 3 wheels at 50. now you would take your wheels and do hi-lo tests and dial 50-25-25, 25-50-25, and 25-25-50 and when you dial each of these combinations, return back to the contact points and measure where you feel them. one of them will be the 94.4 and 4.6 and two of them will be 94 and 5, the 94.4 and 4.6 will be the wheel that the gate is on. on an S&G 6730 wheel 3 will usually be the 1st to show it's gate position. I hope this makes sense and perhaps you are already doing all this, but are not as wordy as my long replies. I welcome any corrections if I got anything backwards, I am still learning the art myself and am by no means an expert. ive read safecracking for everyone, safemans guide volume1, safecracking for computer scientist do you have a favorite that you could suggest. im not looking for more contact points im looking for the answer to after i do the high low test how do you come up with the right answer. that is what i have been doing ill start with awl and then find a low point then i will do the high and low my problem besides many is ill get LCP94 AND RCP 2.5 how do i get the contact point that tells me which wheel im not good at explaining i ran a body guard service for years and and never had to explain it was all about reaction.. i have read alot of pdf on manipulating. im just a hands on person not book smart at all. i do thank you two guys for taking time to explain. If i had money i would pay for the help.